On our site you will find specially composed music for sitting dance, seated gymnastics and sitting exercises. With our concept, a layman can design movement units for seniors, people with dementia and people with disabilities. Exercise is the elementary requirement for the health of people of all ages. Welcome to our homepage. Here we want to briefly explain the intension of happiness movement music for old people and people with dementia. "Exercise is the elementary requirement for the health of people of all ages". Multimorbidity in old age, often associated with pain, often severely limits people's physical activity. The Glücks movement music developed by us and awarded by the Federal Ministry of Social Affairs and Health in the form of seated gymnastics, sitting sports and sitting dance CDs is a movement concept that uses newly composed and biographically oriented music as a motor for sports science-based exercises. Our music awakens joy and motivates to participate. By integrating the tutorial into the lyrics, ist is easy to implement and implement for laypersons and professionals alike. 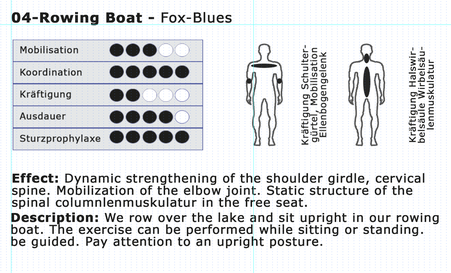 The rowboat is a typical sitting gymnastics. As the basis serve us the sport-scientific bases in relation to the Exercise, exercise length and necessary rest breaks. We always consider the areas of mobilization, coordination, strengthening, stamina and fall prevention. The movement song "Charleston" is biographically oriented and designed as a seat dance. It is easy to implement and makes the old man much joy. Our video from the "Charleston" gives an impression of the simple implementation.